Proprietary Fusion Technology combines a stainless steel face, sole and body with a lightweight carbon composite crown to create maximum perimeter weighting for exceptional stability on off-center hits. The stainless steel face, sole and body utilize Variable Face Thickness, a patented Callaway Golf technology, and are joined in place with the crown. 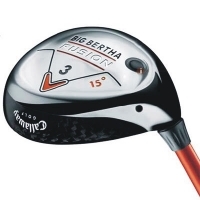 This provides an ultra-low, optimized center of gravity for higher ball speed, a strong, high ball flight, power in every shot, and the highest Moment of Inertia of any Callaway Golf fairway woods for the most stability and accuracy on off-center hits.